Fig 1: Unified model of Active Galactic Nuclei (image credit: NASA). Almost every galaxy in the Universe harbors in its center a supermassive black hole with a mass of millions to billions times the mass of the Sun. While most of these monsters are dormant, like the one in the center of our own Galaxy, some supermassive black holes feast on infalling matter. That matter is gathered in a flat disk, called the accretion disk, around the black hole before falling into the abyss. The rotating disk swirls up the magnetic field, which forms a narrow channel along the polar axis of the black hole through which particles stream away at tremendous speeds close to the speed of light. These jets are the origins of some of the most extreme outbursts seen in the Universe. 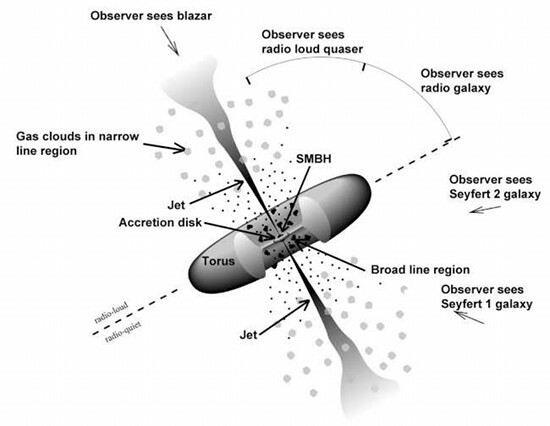 A system of a feasting supermassive black hole with an accretion disk and a jet is called an active galactic nucleus (or AGN for short; see Figure 1 for an illustration). In some AGN the jet happens to line up with the line-of-sight from Earth. This special type of an AGN is called a blazar. Blazars are prime targets to study jets, because the radiation emitted by the jet is very bright. This is due to an effect described by Einstein's theory of special relativity, namely that most of the radiation produced by fast moving particles is emitted in the direction of travel. Blazars emit radiation across the entire electromagnetic spectrum, from the lowest radio frequencies up to the highest energetic gamma-rays. On top of that, blazar emission is highly variable. Fluxes have been observed to double in a matter of minutes, which shows what dramatic sites these jets are. In order to produce gamma-rays, jets must accelerate particles to tremendous energies. For reasons that are mostly unknown, some jets are able to accelerate particles to higher energies than others. The former jets produce gamma-rays with energies of more than 1 TeV 1, while the latter jets barely produce gamma-rays above an energy of 50 GeV. Hence, jets accelerating particles to low energies cannot usually be detected by ground-based gamma-ray observatories, such as H.E.S.S., since these observatories have a low-energy threshold of roughly 50 GeV. However, even jets standardly accelerating particles only to low energies, might produce radiation with higher energies during strong outbursts, which is why gamma-ray observatories also target low-energy accelerators during bursting states. 3C 279 is one of these low-energy accelerating blazars, which usually cannot be detected by ground-based gamma-ray observatories. It is located at a safe distance from Earth, more than 10 trillion light years away, i.e. at a cosmological redshift of z = 0.536. 3C 279 is known to be one of the most variable objects, experiencing flares of all scales across the electromagnetic spectrum. It was detected above 50 GeV by the ground-based gamma-ray observatory MAGIC, located on the Canary island of La Palma, in 2006  and in 2007 , but was not seen again since then above this energy - until June 2015. Fig 2: Multiwavelength lightcurves (photon or energy flux vs time) of the flare in 3C 279. 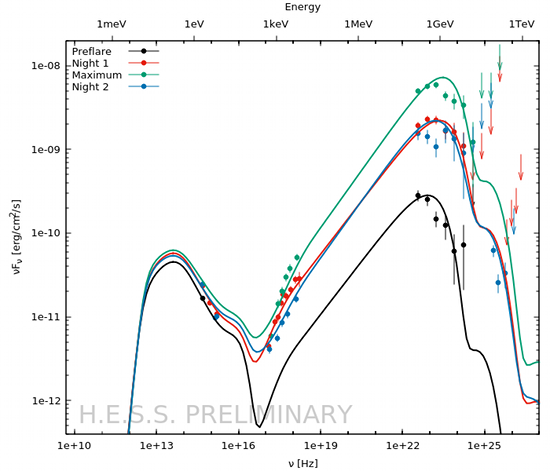 The top panel shows the gamma-ray lightcurve measured with the Fermi satellite with a 3hr binning. The colored dots refer to the integration periods of the spectra in Fig. 3: First night of H.E.S.S. observations (red), the maximum of the flare (green), and the second night of H.E.S.S. observations (blue). 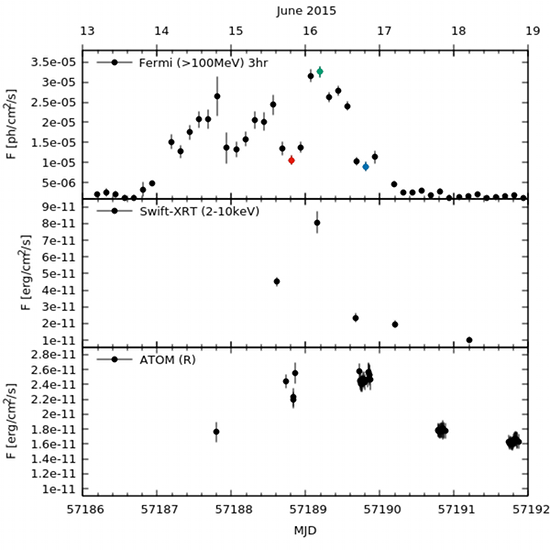 The middle panel shows the X-ray lightcurve obtained with the Swift satellite. The bottom panel shows the optical lightcurve in the R-band measured with ATOM, an optical telescope located next to the H.E.S.S. telescopes. At that time the space based Fermi Gamma-Ray Space Telescope, which observes the entire gamma-ray sky above an energy of 100 MeV once every 3hrs, noticed a tremendous outburst of 3C 279. Despite its huge distance, 3C 279 became briefly the brightest gamma-ray object in the sky. H.E.S.S. quickly followed up on this event, and although the observations missed the brightest moment of the flare (see the red and blue dots in the top panel of Figure 2), it still significantly detected the source. This detection has profound implications for the interpretation of this monstrous flare, because very-high-energy gamma-rays (those with an energy above 100 GeV and detected by H.E.S.S. in this flare) are prone to interact with optical photons to produce electron-positron pairs. Hence, any dense optical photon fields near the jet would keep the gamma-rays from escaping, if the emission region is immersed within such a photon field. 3C 279 hosts strong optical photon fields within 1 light year of the central black hole, and usually it is within this distance that these extraordinary flares are assumed to originate. Clearly, the detection of 3C 279 with H.E.S.S. suggests that this flare took place at a distance greater than 1 light year from the black hole, beyond the strong optical photon fields. Apart from that, the spectral evolution during the event, as shown in Figure 3, challenges the standard explanation of blazar flares. Typically, the double hump structure is explained by the "one-zone leptonic emission scenario", where the entire detected radiation from a blazar originates from a single zone of just a few light hours to a light day in diameter somewhere close to the base of the jet. The variability seen in this event (see Figure 2) also calls for a one-zone scenario, since the radiation source cannot be larger than a light day, or else the rapid variability seen in the lightcurve could not be communicated within the emission region. However, it was already demonstrated that the emission must come from a larger distance from the black hole than typically assumed. Additionally, the leptonic scenario invokes that all emission is generated by the same electron-positron particle population, implying that anything causing such a giant flare in the gamma-rays must also be reflected at optical wavelengths. However, no similar reaction in the optical regime at ~1014 Hz compared to the gamma rays above 1022 Hz has been seen. Hence, the one-zone leptonic emission scenario cannot describe the spectral evolution of this strong flare, and more complicated scenarios are needed. Fig 3: Spectra (energy flux vs frequency or energy) of 3C 279 during the flare for different times: the preflare spectrum integrated over three days between MJD 57184 and 57187 (black) 2, the first night of the H.E.S.S. observations (red), the maximum of the flare (green) and the second night of the H.E.S.S. observations (blue). Arrows mark upper limits. The lines represent a time-dependent hadronic simulation that reproduces self-consistently the evolution of the flare. One such model is the "hadronic model", which explains the gamma-ray emission by processes involving protons, while the optical emission is still attributed to electrons. Since the optical and gamma-ray emissions are produced by different particle populations, this model has greater freedom to explain the huge flare in gamma-rays without a corresponding strong flare in the optical domain. A realization is shown in Figure 3, where the change between the curves can be explained by the injection and acceleration of protons in a fully time-dependent and self-consistent scheme . If protons are, indeed, responsible for the strong outburst in 3C 279, this could explain the origin of ultra-high energy cosmic rays, which hit the Earth's atmosphere every day, but have not been attributed yet to specific sources. Cosmic rays are charged particles, like protons, with energies vastly exceeding anything created in human-built particle accelerators on Earth 3. Their origin, however, remains a mystery. AGN jets are one of the prime candidates, and the successful modeling of the 3C 279 flare with the hadronic model supports this idea. Additionally, the detection of 3C 279 with H.E.S.S. can be used to search for even more fundamental physics. Some quantum gravity (QG) theories predict that photons of different energies exhibit different speeds, and thus would reach Earth at different times if emitted at the same time at the source. The data obtained with H.E.S.S. can be used to search for this so-called Lorentz Invariance Violation (LIV) leading to limits of the QG scale. Measuring a LIV induced deviation of the speed of light from a constant with an astrophysical source requires the fulfillment of 3 criteria: (i) the emission of very high energy gamma-rays, (ii) the source should be very distant and (iii) exhibiting variability with high statistics. 3C 279 fulfills these criteria, given that it is the most distant source detected till now with H.E.S.S., and that the 2015 flare was detected with a large number of photons in the required energy domain ( > 50 GeV). The search for energy dependent time-delays, i.e. an energy dependent speed of light, was performed following methods outlined in . As no significant time delay was found, limits on the QG scale were computed, and compared to limits derived with outbursts from other sources. The limits generated from the 3C 279 data set are less constraining than those obtained from the huge flare of PKS 2155-304 in 2006 , which had been observed with much higher photon numbers. However, since 3C 279 is located at a much larger distance, the derived limits are extremely important as they allow us to match the limits obtained from Gamma-Ray Bursts. 1 "eV" is a unit of energy, defined by the energy an electron can gain in a voltage difference of 1 Volt. An optical photon has roughly the energy of 2 eV, so a gamma-ray with 1 TeV is almost 1 trillion times more energetic than an optical photon. 2 "MJD" is an astronomer's way of counting days. MJD 1 corresponds to November 18th, 1858, and days have been simply added up since then. As can be seen in Figure 2, MJD 57190 corresponds to June 17th, 2015. 3 So don't be afraid of the LHC creating Earth devouring black holes. If human-built accelerators would be able to produce such black holes, nature would have destroyed us many times over. C. Romoli, M. Zacharias et al. (H.E.S.S. Collaboration), "Observation of the extremely bright flare of the FSRQ 3C279 with H.E.S.S. II", Proc. ICRC (2017), in preparation.